And four other questions answered in the PtR staff roundtable. After a tough road run, the Spurs have turned it around during the recent home stand. In a matter of hours, the Spurs rose from the 8th seed to 5th seed and dropped back down to 7th. While enduring rumors that Kawhi Leonard would join the Spurs last week against the Pelicans, San Antonio continues without their two-time Defensive Player of the Year. As things look like a traffic jam in the 3-10 spots in the Western Conference, perhaps it is time to take a look at exactly what is going on in the East. This week PtR Contributors Marilyn Dubinski, Mark Barrington, Jesus Gomez, Bruno Passos, and editor-in-chief J. R. Wilco tackle Tony Parker’s comments on Kawhi Leonard’s possible return, the diversity of lead scorers on the Spurs’ roster, and Silver & Black’s community outreach. Questions were posed to the panel on Sunday and posted Tuesday. For conversations around the Spurs match-ups against the Washington Wizards, Utah Jazz, and Milwaukee Bucks, check back next Tuesday. The Spurs won four in a row at home beating three Western Conference playoff teams. What has been pushing the turnaround? Marilyn Dubinski: Perhaps the Road Trip of Death gave them a better appreciation for home that had been lacking in recent losses, even after returning from the Rodeo Road Trip, or maybe falling down to tenth with the schedule not getting any easier was finally the wake-up call they needed. Regardless, whatever is pushing them now, they can’t afford to let their guard down at any point from here on out. Mark Barrington: The Spurs have been better at home all season. They’ve been finishing out games better in the winning streak than on the road trip, but the overall level of play isn’t that much better, especially the Warriors game, which was pretty poor except for LaMarcus. I’m hoping for a 6-0 home stand, but I’m not counting on it. Jesus Gomez: Aldridge has been amazing, just carrying the offense. This team also plays much better at home. But I think their increased focus on defense is mostly responsible for the turnaround. Patty Mills and Dejounte Murray are pressuring ball handlers and denying the ball at the point of attack. The rest of the team is using its collective length to become a nuisance in every halfcourt possession. There’s a lot more energy on that end. As a result, the Spurs have allowed just 87.7 points per 100 possessions in the past four games, the stingiest mark in the league. 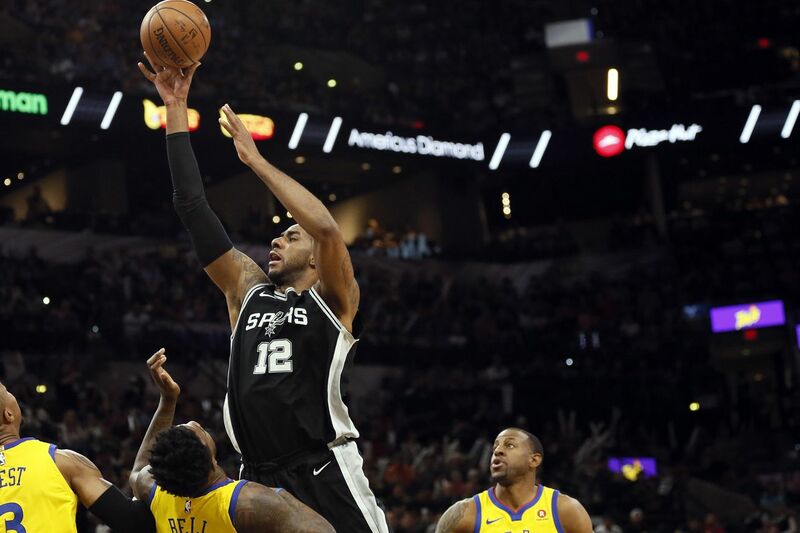 Bruno Passos: Lineup continuity and balance have both been huge, as has playing at home, but the Spurs don’t get three of those wins without Aldridge taking his game to the next level. He outplayed two guys that many would have ahead of him in big-man rankings in Anthony Davis and Karl-Anthony Towns, and has been the best guy on the floor throughout. J. R. Wilco: I’d say it’s due to three things: LMA’s sublime play, the excellent defense, and the increased the intensity from dropping out of the playoffs. Looks to me like if the team continues to play like this (which is not a guarantee) they’ll end with a record just good enough to make the playoffs, but not good enough to separate from the 4-8 seed logjam. Since they don’t own the breakers for 3-way-ties, I’m prepping for the worst: a 7th or 8th seed finish. As of last week when Derrick White led all scorers with 14, every member of the Spurs roster at one time has been the scoring leader this season. What does this say about the team? Dubinski: It can be seen in both a positive and negative light. It can be viewed as a sign of their superior depth and how every player on the roster is capable of leading on any given night, or it can demonstrate the lack of a second player who can step up and lead when LaMarcus Aldridge is either out or having an off night, so when that is the case they just have to hope someone else gets hot without knowing who it may be. It’s not a bad stat by any means, but it would be easier to be impressed by it if this was your typical 55-60 win Spurs team. Barrington: That they haven’t been able to count on a core group to perform consistently. LaMarcus has been the leader all season, and whenever he has a poor to mediocre game, nobody else has really stepped up, and somebody ends up having to be the leading scorer, and it’s usually the new guy with 14 points or so. Gomez: That this team never had a third option. Not a real one. With Kawhi out, the Spurs rely heavily on Aldridge to carry them. When he can’t, there’s no one who can consistently step up. Rudy Gay was probably supposed to be that guy, but injuries slowed down his return to form. Hopefully, he’ll go back to being a reliable scorer before the playoffs start. Passos: Mostly, that they don’t have Kawhi Leonard TBH. Wilco: Lack of consistency, pure and simple. Tony Parker thinks at some point it doesn’t make sense for Kawhi Leonard to come back. Agree or disagree? Dubinski: I definitely get Tony’s point, and to me it depends on the situation. The Spurs are currently winning and showing some nice chemistry, so they may have something going that you don’t want to mess with. However, if they start struggling again and find themselves fighting for their playoff lives, then I wouldn’t be against bringing Kawhi back if he’s ready regardless of the timing. It’s hard to imagine them going any further in the playoffs without him than with him, so at this point what would it hurt? Barrington: I’m speculating here, but financially, it doesn’t make sense for Kawhi and his advisers to risk the possibility of a $200 million plus Super Max contract if there’s any chance of serious injury. From the standpoint of a bean counter, the best course is to keep Kawhi encased in bubblewrap until the money is guaranteed. I don’t think that’s Kawhi’s personal position, I feel certain he wants to play. As do basketball fans everywhere, we all want to see him play, and I don’t care if it only turns out to be garbage time in a meaningless regular season game. Gomez: I disagree. If Leonard doesn’t risk further injury by playing and he has been cleared by all the doctors involved, I want him on the court. Not only would he raise the team’s ceiling, even if he’s not in ideal shape, but he would also get to play with this team, under Pop, once again before having to make his decision on the super max. I think that could be a good thing. Passos: I don’t think we can look at it in absolute terms like that. If he were to suddenly be 100% healthy, it would obviously be worth reinserting him and allowing for a bit of disruption in the style and tendencies they’ve developed as of late. That said, I think Tony’s possible idea of a late-season Leonard return — which resembles his shaky midseason attempt — is probably the most likely scenario. Let’s take a break from the hectic Western Conference playoffs race. Who do you see making the Finals out of the East? Dubinski: I so badly want to think the Raptors, but when push comes to shove they tend to flop in the playoffs, plus it’s always hard to count out LeBron James regardless of how his squad performs in the regular season. The Celtics should have home-court over the Cavaliers in the second round, but they’re dealing with more and more injures and are currently trending downward. My heart says Toronto, but my gut says Cleveland. Barrington: The Raptors have been playing best, but the Cavaliers are getting healthy and they have LeBron, who has been rounding into post-season form after taking it easy for most of the season on the court. The Celtics are too injured to go far in the playoffs this year. As much as I would be bored by it, I feel it’s going to be the Cavs again. Gomez: I think the Cavs are going to make it back to the finals and be dismantled by whichever teams comes out of the West. Hopefully the East will be more competitive at the top next season, with the Celtics fully healthy. Passos: Forget whatever I just said about nuance and not thinking in absolutes. The answer, until proven otherwise, is LeBron James. Wilco: Even though I’m setting myself up to be crushed by LeBron and the Jamesaliers, I’m fully investing in the Raptors for all of my Eastern Conference positive emotions. The upside is attractive enough to risk the near-inevitable destruction of my hopes. Last week USAA hosted a training at the AT&T Center. James Borrego and Ime Udoka spent an afternoon holding a Spurs practice for active military personnel. This week Silver & Black Give Back unveiled the 2018 Fiesta Medals. How important are the Spurs to the San Antonio community beyond being a sports franchise? Dubinski: Very important. The Spurs are probably one of, if not the most beloved sports franchise by their community, and it’s not just because of the winning. They bring in high character guys who love their community just as much as we love them and show it with full support. There’s a reason you see so many former players sticking around San Antonio after retirement or frequently coming back for visits. How many other places do you see players like Fabricio Oberto getting shown so much love when they attend a game? Barrington: They’re important not only to San Antonio, but to the nation. As an organization that demonstrates how people from all backgrounds and countries can work together to make something great, it’s inspiring to us all. And they give so much to the community. Gomez: Living in Argentina, I don’t have first hand experience when it comes to the Spurs organization’s relationship with the San Antonio community. From afar, all I can say is that it seems the franchise truly appreciates the city and the city clearly loves the franchise. Wilco: Excellent question that deserves its own post. Do you have a question or comment for In the Bonus? Post in the Comments section.